Apologies if this offends you, but for months slow cookers screamed mom status—much like the mighty casserole, which I refuse to make unless I have some Rugrats under foot. Slow cookers sang the (reasonable) defeated cries of the woman tired of carting her kids back and forth to extracurricular activities; the woman who was just trying to get something onto the table. A slow cooker just wasn’t for me. I was young, energetic, with time on my hands and a passion for frantic kitchen forays. And then I looked at my school schedule, and my upcoming work schedule (26 hours a week, baby), and realized perhaps the slow cooker, the original set it and forget it machine, needed to have a supporting role in the kitchen. Prejudice aside, the wheels started turning. Why, I could throw everything into it during the morning, go to class, come back to check in, and go about my day. Six to eight hours later I would have a fragrant smelling home and enough food to last me throughout the week. My weekly soup obligation started to seem like less of a hassle, and, of course, the 21 year old in me saw the potential of still having a hearty dinner(s) during the weekend, despite a moderate hangover. Seeing as I have to pass through the kitchen to reach the bathroom, the hallowed resting spot for the all mighty Tylenol bottle, even angry at the world, mildly still inebriated me could toss a few things into the slow cooker and go back to bed. Hallelujah! I was in no position to buy a slow cooker, so casually I called my mom, asked her about her life and nonchalantly asked if she, oh, had an unused slow cooker around. She did. And it’s probably older than me, because I have never seen her use it. Sturdy and made before the time of planned obsolescence, the old gal started up fine. 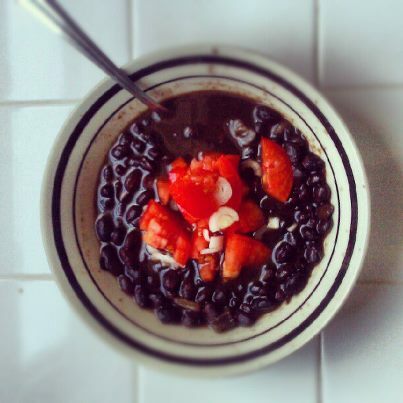 In keeping in line with frugal meals, I chose a spicy black bean soup. The ingredient list was simple: a pound of black beans soaked overnight, some spices, and good quality chicken broth made sweet kitchen love for six hours. Much like the rice and beans, the soup was humble looking, but surprisingly pleasant on the taste buds. While I don’t think anyone under the age of 30 should resort to making a tuna casserole (or any sort of casserole), I think all 20-soemthings can find a place in their heart—and kitchen—for this safe and efficient appliance.